Showbiz has been buzzing with news of the engagement of Marian Rivera and of Heart Evangelista. Actor Dingdong Dantes already popped the question to his long-time girlfriend Marian in an intimate setting last 2012, but felt it necessary to do so again during Marian’s birthday celebration last August 9. “Sa tingin ko mas magiging espesyal siya ngayon dahil ngayon, kaharap mo na ang pamilya mo. At andito ang mga taong nagmamahal sa atin,” said Dingdong. 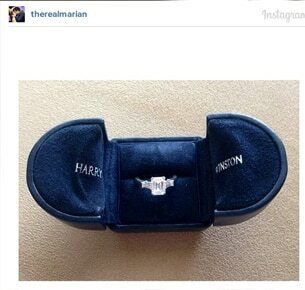 The classic Harry Winston Emerald-Cut Diamond Engagement Ring is actress Marian’s most prized piece of bling. Handpicked by her fiancé, this rectangular 2.13 carat diamond is set in platinum and adorned with tapered baguette side stones. In just a few months, this ring will be joined by a wedding band as the lovebirds exchange vows on December 30 at the Immaculate Conception Cathedral in Cubao, Quezon City. Heart received a heart-shaped diamond ring, an Escudero family heirloom. Quino, Chiz’s son, delivered the ring as Chiz knelt in front his beloved.